Lightcraft Technology has standardized in a method of calibrating lenses that makes it so the calibration marker board does not move, or moves a handful of times. We call this the Static Lens Mapping method. 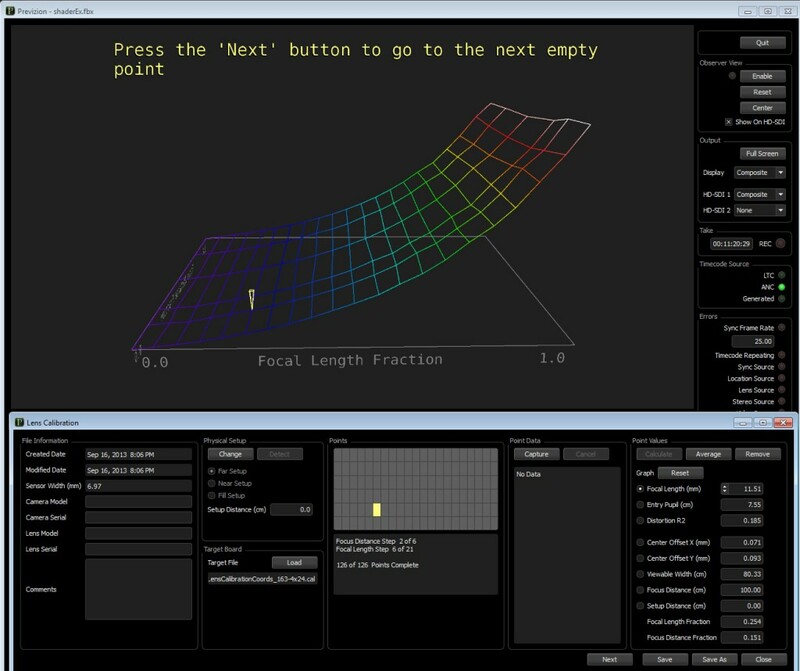 Input lens focus distances with lens controller values. Add light to board as necessary. Increase ISO or gain as needed. Determine distance to board. 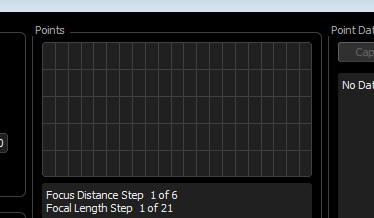 This will be your first Setup Distance, measured in centimeters. 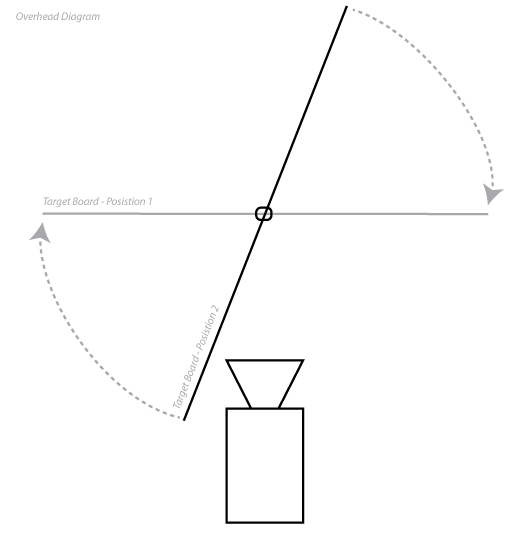 Initiate calibration cycle (described below) for each step from this first distance. Some points may be too out of focus for proper detection. Repeat calibration cycle for as many points as possible from this same position. Before moving anything, verify calibration. If necessary, delete a bad point and re-calibrate the point. When verified, move the board to the next position to capture the points that were not detectable from previous Setup Position. Repeat steps 5 through 8 until all points in the lens are calibrated. A special thanks goes to Mr. Ron Fischer, Technical Director at NBC Universal, who has collaborated with Lightcraft Technology to improve the lens mapping process. Instead of spending hours trying to hand edit or average between points to achieve a somewhat smoother lens calibration, because the board never moves, this process allows for re-capture of a point that is deemed bad. This removes any guess work. 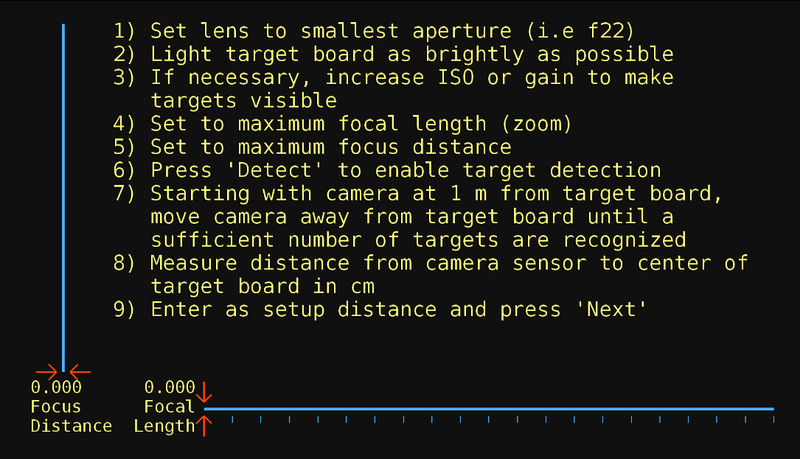 With our legacy calibration method, we used to have to move the camera at various distances from the calibration board. These were: min-focus (approx. 75cm), 100cm, 200cm, 300cm, 400cm, 500cm and 800cm. The problem was that the software assumed an absolute even number, when in reality, if the camera needed to be at 300cm from the board, it would be a few centimeters off. At any one distance, one or two centimeters off would not make a huge difference, but over the course of the entire lens calibration process, the little offsets in setup distances add up. This used to result in an uneven lens calibration. With the static lens mapping method, we remove all guess work and get a more far-reaching and accurate lens calibration as a whole. We have also implemented a mechanism that saves all captured images in an archive to allow for future re-calibrations. This means that, should Previzion’s algorithm improve, you will be able to re-run the same lens calibration captured images. This mechanism is still being implemented, but we are already saving all captured images for future use. The 14-foot calibration board, when mounted correctly (please reference Lens Calibration Hardware for more information), should oscillate almost 90 degrees. From each extreme, the board should go from flat to almost touching the camera with one of its wings. While setting up and moving the board around, always make sure that the board does not hit anything. Keep the foot switch accessible should you need to stop the board from oscillating. Before starting the calibration setup, make sure to set your Camera Sensor and video input. 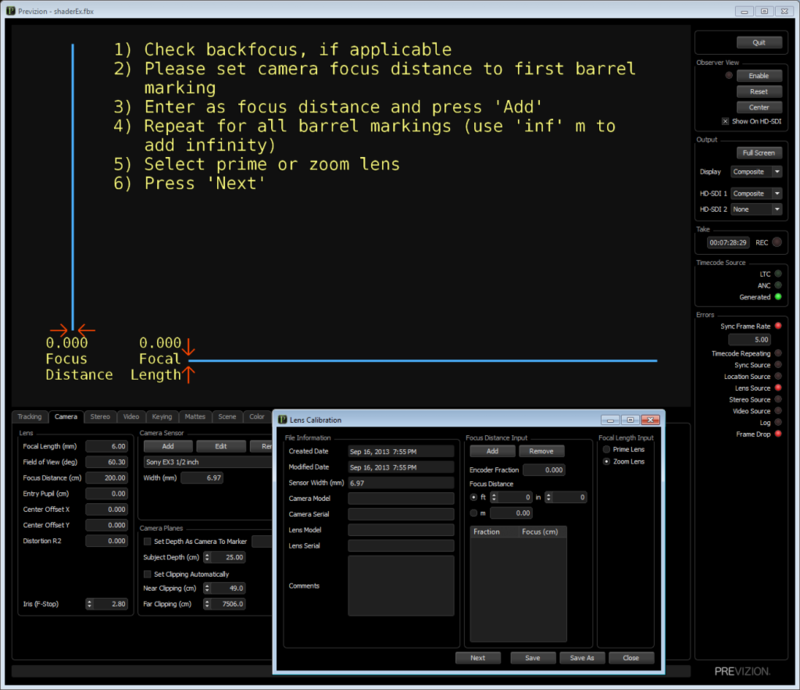 Other camera and Previzion settings are described in Lens Mapping Overview. This will open the Lens Calibration window. You should position this window on top of your main Previzion window as the two interact with one another. Make note of the camera and lens model and serial numbers for future reference. 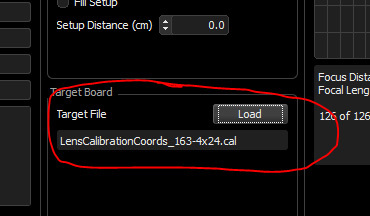 Add any comments for other operators to reference when dealing with this lens calibration file. Make sure to check backfocus for your lens before starting. There are a few ways to check backfocus. A simple test is to move the focus ring of the lens to one of the focus markings and then position an object to the distance that the barrel marking indicates. Repeat this for at least three separate distances. For example, if the lens focus is set to be at 2 meters away, when I place an object at 2 meters away from the lens, it should be in focus. A commonly used pattern to judge focus is a focus chart or a Siemens star. The values on the side of the lens should match the position of critical focus. If they don’t match, backfocus needs to be adjusted. For zoom lenses, an indicator that the backfocus is off is having the critical focus plane distance change simply by zooming in or out. For instance, the operator zooms in, focuses to an object and when he or she zooms out, the object is no longer in focus. To have Previzion determine which distances to calibrate the lenses from, the lens calibration interface requests that you enter all the focus distances written on the side of the lens barrel as you physically change focus to each distance. 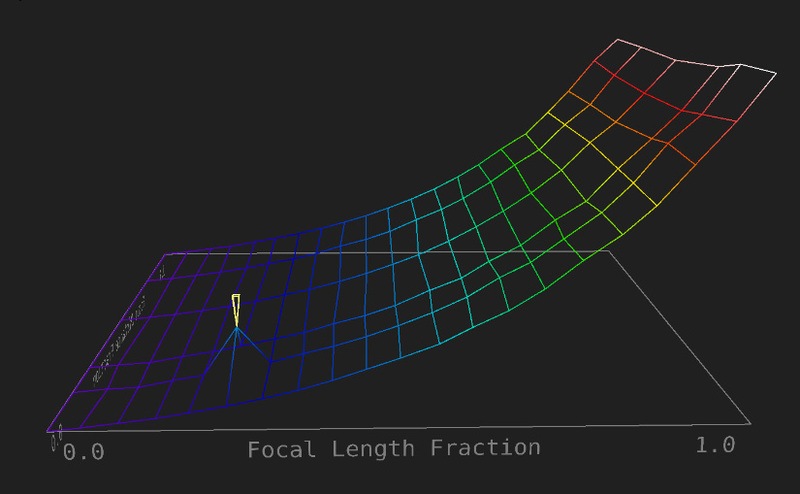 As you move the focus on the lens, Encoder Fraction will reflect the relative lens travel on a normalized value between 0.000 and 1.000, where 0.000 is the closest focus and infinity focus is 1.000. If a lens has focus distances: 65cm, 90cm, 1 m, 1.25 m, 1.5 m, 2 m, 2.5 m, 3 m, 5 m, 10 m, 18 m and infinity. 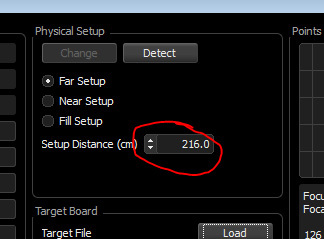 For each distance, move the lens to be on the exact mark on the side of the barrel, then input the corresponding distance into Previzion and press Add. Repeat this for all distances. 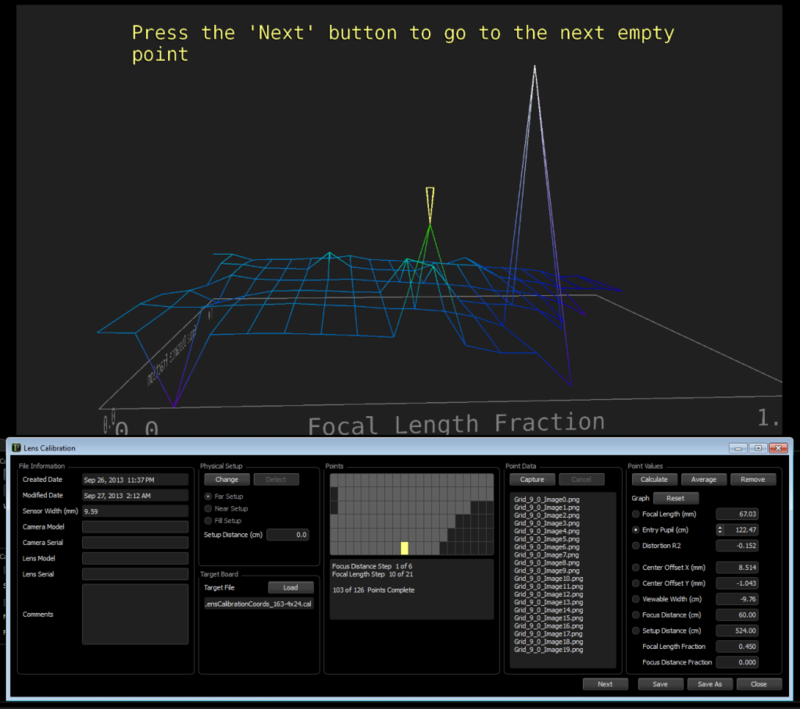 For infinity focus, physically type “inf“ into the meter input box. For all focus distances you may choose to enter values in feet and inches or meters, with the exception of infinity. 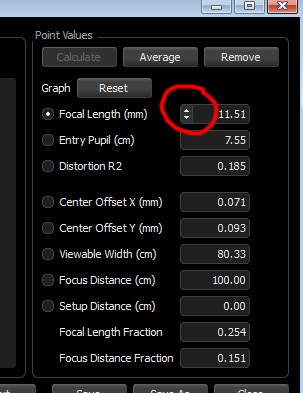 Once all values are entered, select the type of lens being calibrated: Prime Lens (fixed focal length) or Zoom Lens. Then press Next. Previzion will suggest to use only the most crucial points. You may choose to calibrate more points, but these are the recommended values. 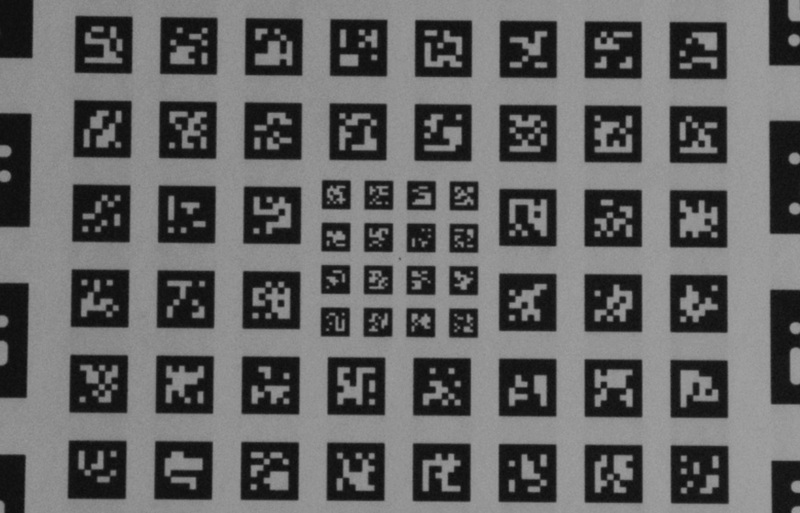 Known formally as “Marker File,” the Target File contains the corresponding pattern for the calibration board. For the 14-foot lens calibration board, use LensCalibrationCoords_163-4×24.cal. In the process of calibrating the lens without moving the board to the various focus distances, it’s crucial to stop-down the lens to its smallest aperture as the process requires the most depth of field to work. This is important because, should a point show that it has a bad solve, we can delete the point and re-capture it. This only works because nothing moves. Under Physical Setup, there are a few options. We recommend to always start with a Far Setup, then Near Setup, when necessary, then Fill Setup, when necessary. 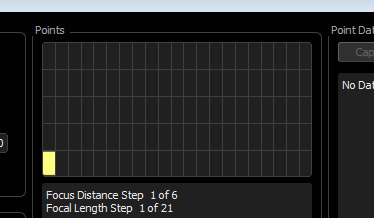 The on-screen instructions are actually step-by-step instructions for determining setup distance. We start with the camera at max zoom and max focus and, if there are points in the near focus that we cannot calibrate, we will move the camera and establish a second setup distance to capture the near points. Starting with camera at 1 m from target board, move camera away from board until a sufficient number of targets are recognized. The calibration board does not need to actually be at critical focus to be detected by the software. Being tangent to the circles of confusion may be enough for a given lens. The software is quite forgiving when it comes to detecting the square markers. When you have determined the initial setup distance, enter the distance between the camera sensor and the center of the board. This measurement is in centimeters. The screen instructions will instruct you to center the crosshair with the center of the board then turn on the calibration motor. The text on the screen says to “start target board spinning,” but, in the case of the 14-foot calibration board, the target board actually oscillates. 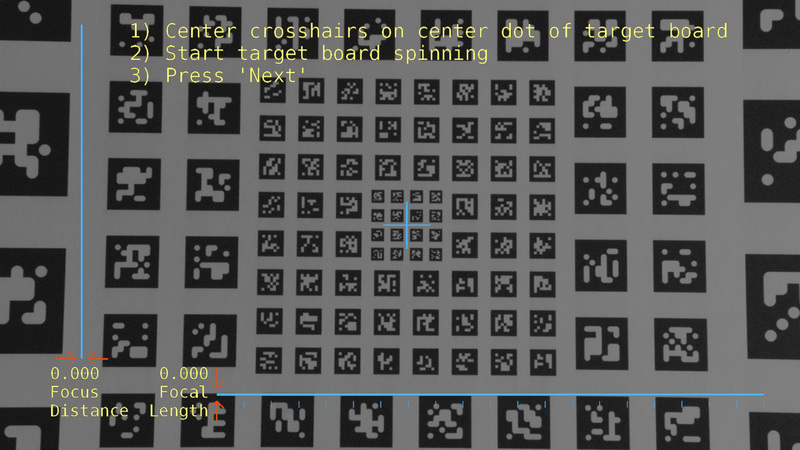 Using either the camera’s center mark (crosshair) or Previzion’s corsshair, aim at the very center of the target board. There is a tiny dot that indicates the center. Because many lenses “walk,” center the crosshairs with the lens zoomed all the way in. After centering the camera. Lock pan, lock tilt and make sure that camera and the board are fixed. Double check that your Setup Distance is correct. Try capturing as many points as possible from this position. This is what is referred to calibration cycle. 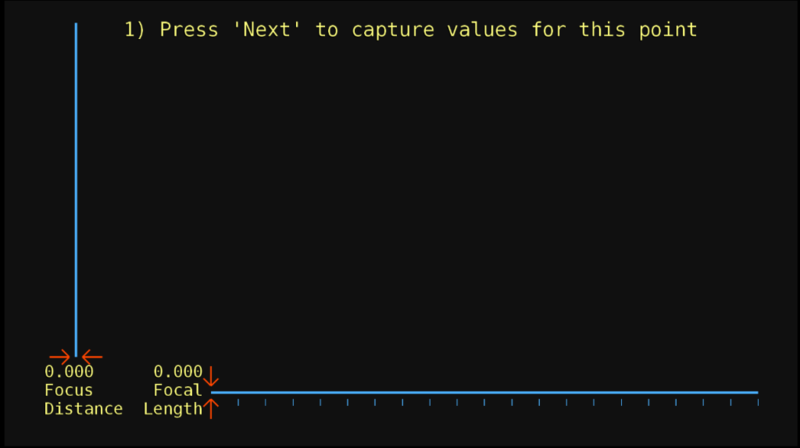 When the screen reads “Press ‘Next’ to capture values for this point,” you can pick which point to calibrate. To select a point, click on the Points grid. 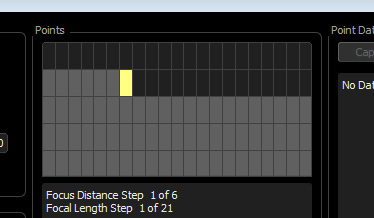 The actual point grid is clickable and you may skip points as necessary. Start with the lower left box. This represents the closest and widest point on your lens. As you capture points, the points grid starts filling up with light gray boxes. It’s not uncommon for a zoom lens to need two Setup Distances to capture all point near the board and another for all the far points. We recommend starting with far setup, which results in a calibration that captures the points close to max zoom and max focus. 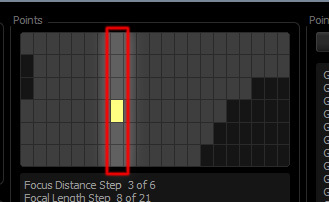 If necessary, on another pass, using near setup, you can capture the points that were not detectable at the first setup distance. For now, gather as many points as possible from this first setup without changing your setup distance. To save your file, you may simply “Save” or, if you are editing or removing points, “Save as…” to preserver the original file. Should you need to do more than one setup, before ever touching anything, check that the points that were calibrated are okay. You may use the graphs to judge which points to re-calibrate and/or look through the lens to see where there are issues in the calibration. It’s normal to have a few bumps and odd points during the mapping of a zoom lens. 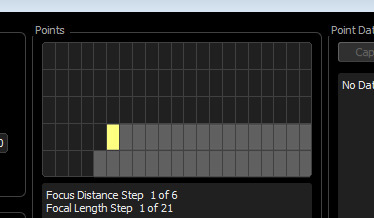 To edit points using the built-in graphs, see Editing and Removing Points below. 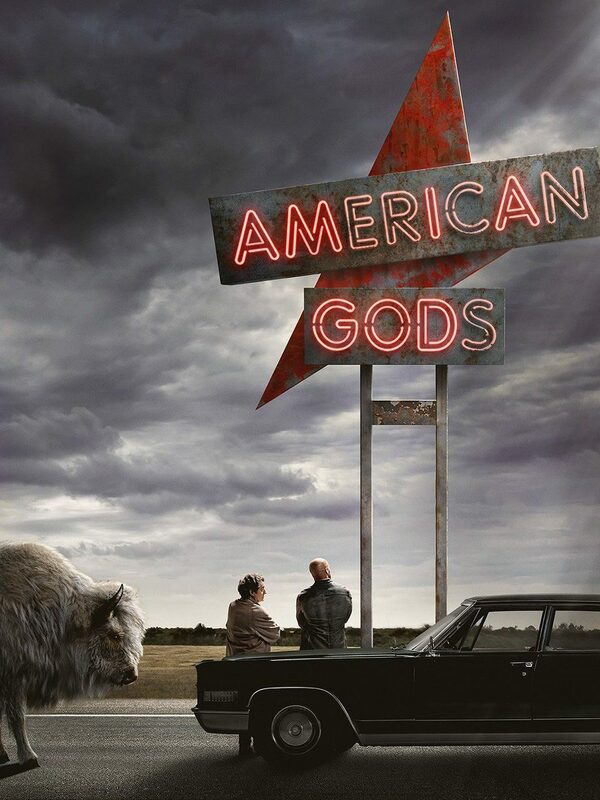 The background should move and track with the foreground. By clicking on calibrated points on the points grid, the screen text will be replaced with a graph. This feature has been released as of build 7686. There are various views for the graph. Each one representing the span of a lens parameter. This is a direct replacement of LensGrapher’s tools. All graphs are actually in 3D and can be moved around to allow for better visualization of the points. If you ever get lost with the graph, use “Graph” Reset to reset the graph to its default position. Always try to “Remove” and re-calibrate a point rather than averaging between points. And avoid manually editing a point’s value, unless recalibrating is not yielding better results. This becomes more crucial in the wide angle lenses and in small sensor cameras. As a final verification step, look through the lens as described above in Verifying Calibration to ensure all points are mapped properly. To edit manually a point, click on the the point in the points grid and adjust its value with sliders next to the values. It helps looking at all the values for each column to determine how a given value is tending in the neighboring points. Should manual editing prove to be too difficult or ineffective, there is also an “Average” option. We don’t recommend using this option during the lens calibration process. 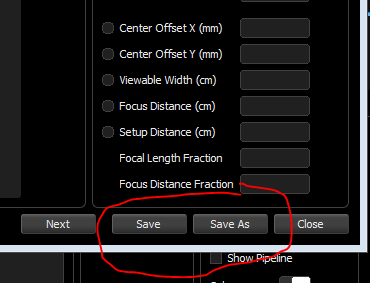 Use it only if re-capturing a point and manual editing of a point are not possible or effective. 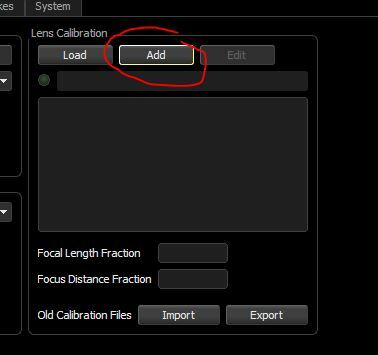 As of build 7686, the lens calibration format is different from all previous versions of Previzion. The file format is still an XML with a .cam extension, but it also has all images captured during lens calibration in its own directory. 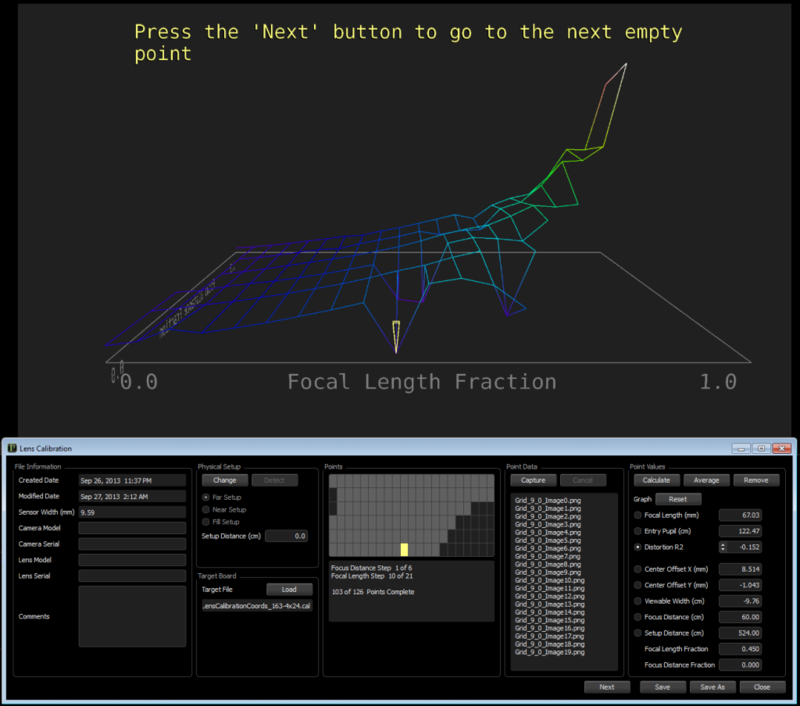 The goal is to have a format that, should Lightcraft improve Previzion’s lens calibration algorithm, the same images can be reprocessed. For compatibility purposes, Previzion allows older formats of lens calibration files to be imported into new formats and the current lens calibration format to be exported as the old format and so on. This is most useful when working with older versions of Previzion.